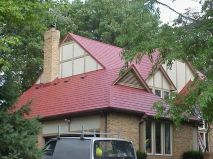 The initial cost for your new metal roof is carefully calculated. Factors such as slope, linear feet of trim, access, color, and style all need to be determined before any pricing accuracy is possible. The number of "squares" of roofing also is a factor but it alone is not enough. The first home is relatively simple. This type of install is referred to in the roofing business as an "up and over". The slope is mild and the detail work is minimal. Home number two gets more complicated. It's up high, the slope is less walk-able, wall flashings and other trim work is needed. The third home is complex and therefore can expect more labor and more trim accessories (this is true regardless of whether metal or asphalt is put on). The slope is steep and it is very "cut up". In short, metal roofing is more of an "investment" mindset rather than a short term cost/expense mindset. 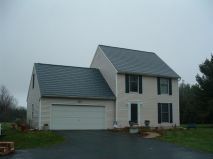 If you are planning on moving in less than 5 years, it is probably not a good choice to go with a metal roof. 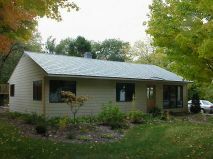 If, however, you plan to live in your home for many more years and shudder at the thought of doing one or maybe even two more asphalt roofs in your future, then metal roofing may be your ideal choice. If you feel you are interested in a specific estimate for your home, please contact us and we will be happy to help.